Turner, Barbara A. (2005). The Handbook of Sandplay Therapy. Sandplay is a hands-on, expressive, play therapy technique developed in the mid 1900’s by Swiss Jungian analyst Dora Kalff. Sandplay is theoretically rooted in Jungian analytic theory, and integrates the “World Technique” of British psychiatrist Margaret Lowenfield along with Eastern thought and philosophy. As the name implies, play is the central feature of Sandplay which facilitates a child’s natural capacity for change and healing. Through the sandplay process children ( and adults alike ) portray, rather than verbalize inaccessible feelings and experiences often difficult to express in words. Margaret Lowenfield, a pioneer in play therapy and a teacher of Dora Kalff, developed the “World Technique,” as a means of communicating non- verbally with children in treatment. Lowenfield understood that children learn through play. She was one of the first therapists to consider the powerful healing impact of children’s “world pictures” made in the sand. C. G. Jung believed that each person strives to achieve wholeness by attaining a harmony within consciousness and unconsciousness and that this can be accomplished through dream study. The sand tray is seen as an aspect of our imagination. Dora Kalff further integrated her study of Eastern Philosophy into the foundations of Sandplay. Through her studies and close contacts with various prominent Zen Masters and Tibetan teachers ( Dalai Lama) she came to understand that the spirit of Zen is implicit in the sandplay method. The therapist must create a safe space where the path to self -discovery is open. The goal of Sandplay is to activate on the deepest psychic level a patients natural internal capacity for healing. This is accomplished through the process of viewing, choosing and placing miniatures in the sand. The successive scenes created by the miniatures symbolically act as a bridge between an individual’s inner and outer world. Unconscious conflicts appear as symbols and are able to be reordered in a healthy way. 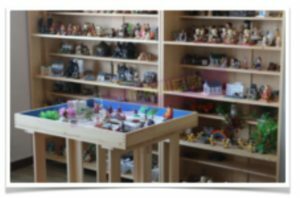 In sandplay therapy, patients are invited to “create a world in the sand” utilizing sand, water and miniature figures that represent all aspects of life and fantasy. The figures are arranged on shelves that are nearby the tray. The sand tray is of wooden construction and is 28 1/2 inches long by 19 1/2 inches wide and 3 inches deep. These dimensions are said to contain the natural span of one’s visual field. The sides and bottom of the inside of the tray are painted light blue allowing for the representation of water in the sand. The therapist sits close by and takes notes of what the child says, does and what figures they choose. The therapist can sketch a diagram and/ or take a photo for later reference. Sandplay therapists do not interpret or direct the patient in any way but rather safely contain the emerging unconscious material. Analysis and/ or interpretation is only offered after adequate time has passed for the integration of the sandplay work that was completed. It is not possible or necessary to understand everything that transpires in a patients sandtray. Martin Kalff (1993) , sandplay teacher and Buddhist scholar states that verbal or written analysis can not fully represent the symbolic contents of a sand tray. Successful interpretation involves thought but “should also include the functions of intuition, feeling and sensation.” Participating in the patient’s sandplay therapy on a pre-verbal level is paramount to their healing and transformational process. It is also helpful if the therapist is familiar with the cultural and archetypal dimensions of the sand tray contents. For further information on the history and or clinical application of Sandplay please refer to the resources listed above.